This is a photo on a cloudy day of San Francisco Point in the foreground, which is the dividing line between Langosta Beach and Tamarindo Bay, and the small Capitan Island, and across Tamarindo Bay is Cabo Velas. I took this photo from high up in the Crystall Sands condo. Tamarindo is a small resort town. Because most people in town are tourists, it does have taxis, although the average taxi ride is probably about two or three minutes long. There are always taxis at an improvised taxi stand in the center of town. I have never taken a taxi in Tamarindo, as we usually walk everywhere in town, and we have a car for longer strips out to the supermarket, which is the one place in town that is not within walking distance. Today is Sunday, so we have new photos posted on our Viva la Voyage travel photo site. This week we are showing photos of Bhutan, featuring some of its temples. Former Costa Rican President Laura Chinchilla and former Mexican President Vicente Fox visited Arizona on Tuesday to promote trade and investment in their countries. They met with members of the Board of Directors of the Arizona Chamber of Commerce and Industry. I am a Board member and took this photo during the meeting. I was thrilled to have the opportunity to meet Presidents Chinchilla and Fox and they both spoke eloquently and forcefully about the progress and opportunities of their countries. 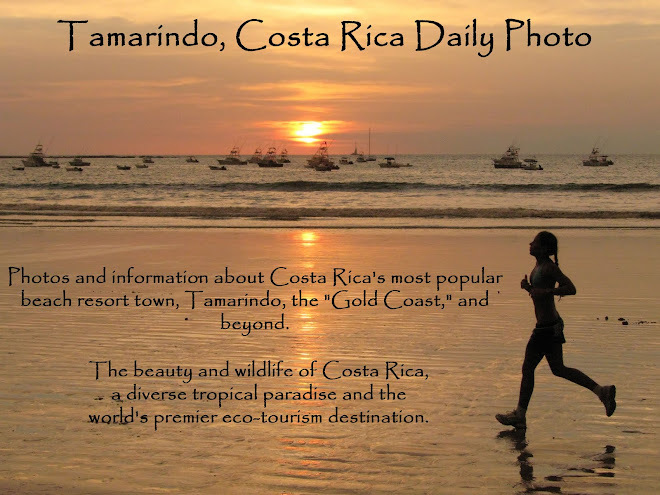 With this connection between Arizona and Costa Rica, my wife and I are for the first time using the same photo for my Costa Rica Daily Photo website and her Scottsdale Daily Photo website. This week we have photos of Antigua, Guatemala, posted on our Viva la Voyage travel photo site. Red leaves on a trail usually mean that there are leaf cutter ants carrying dinner to their den. The ants do not actually eat the leaves. They feed the leaves to a fungus and eat the fungus. The ants know what type of leaves the fungus prefers. The red leaves may be an attractive color for humans, but I assume that the fungus cares only about taste, and not about the presentation of the meal. After all, the fungus is not only color blind, it does not have any eyes. This week we are showing photos of Antigua, Guatemala on our Viva la Voyage travel photo site. Red leaves on a trail in Costa Rica usually mean one thing, especially when the leaf appears to be in isolation and not among a a group of leaves. Tomorrow I will show a photo from closer down to the ground to reveal why I photographed this leaf. 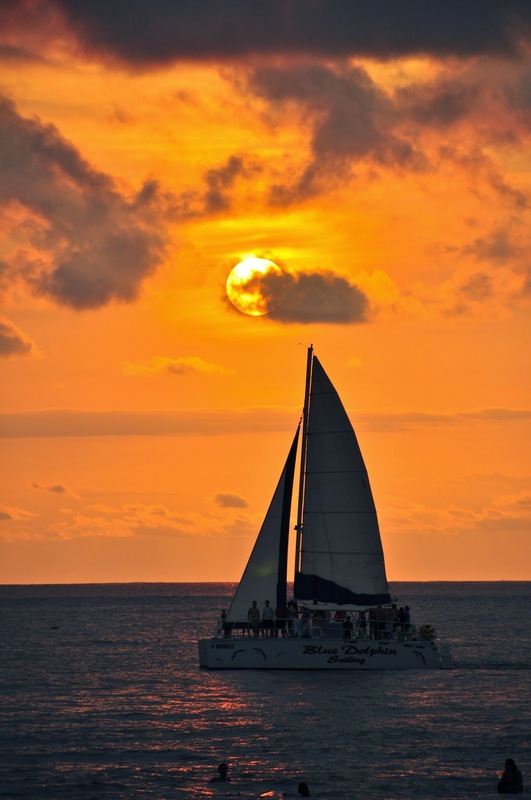 The daily afternoon catamaran sailing excursions return to Tamarindo at sunset. The people on the boat enjoy viewing the sunset from the water. They provide an appealing scene for the people on Tamarindo beach to enjoy the sunset with a sailboat to accent the horizon. I apologize that I have not been able to post every day recently. I will need to post when I can. I have been very busy at work in Arizona and I also have been having some issues with the computer on which my photos are stored. Today is Sunday, so we have new photos posted on our Viva la Voyage travel photo site. This week we are showing photos of Antigua, Guatemala. This driftwood tree provided a foreground point of reference for a photo of the horizon at Playa Langosta. Today is Sunday, so we have new photos posted on our Viva la Voyage travel photo site. This week we are showing photos of the Perito Moreno Glacier in the Patagonia region of Argentina. This is a view of the countryside in the coastal plains of Northwest Costa Rica near the international airport in Liberia. September and October are the rainy season. In December through April the vegetation in this area will be dryer. This week we we are showing photos of the festival in Punahka, Bhutan, in the Himalayas on our Viva la Voyage travel photo site. I usually show glorious sunsets with color that fills the sky. After the sun sets, there is still a sliver of color. This is a long exposure from the balcony of our Langosta condo. The dead tree in the foreground is reflecting lights from the windows of the condos in our building. There is even the hint of a wave that is reflecting a little light. Today is Sunday, so we have new photos posted on our Viva la Voyage travel photo site. This week we are showing photos of the festival in Punahka, Bhutan. We travelled all the way to the Himalayas to see it, as well as other sights in Bhutan. September and October is the rainy season in northwest Costa Rica. I like the beach even when the weather is overcast. Costa Rica needs the rain. There has been a lack of rain this year. Rain is critical in Costa Rica for the many family farms and agricultural enterprises. Rain is also critical for electricity. Costa Rica generates nearly all of its electricity from hydro power. Reliance on this clean, renewable energy source is part of Costa Rica's plan to become the world's first carbon-neutral nation. This week we have photos of daily life in Ethiopia posted on our Viva la Voyage travel photo site. A puppy makes friends on the beach. Today's worldwide Daily Photo Theme is "Rust and Ruin." I am bending the rules. This is not a photo from Tamarindo, but I could not think of a good rusting location in our small town and I have some photos of rusting vehicles from which I decided to choose. This a former "Ocean Safari" touring vehicle. It is a "Woody," with open sides. It would be good in a warm climate such as Costa Rica. In addition to the unusual vehicle, it is odd that the wood exterior is in much better shape than the metal frame. Someone in the past cared for the wood, as ordinarily it would be the first element to deteriorate. I took this photo at the Driven Winery in the Shenandoah Valley of Amador County, California, in the Sierra Foothills east of Sacramento. The owner of the winery must be a lover of old vehicles because they had a lot of old, rusting vehicles, with a lot of farm equipment, on a hilltop at the winery, with beautiful views of the rolling hills and vineyards. To see how other City Daily Photo bloggers have interpreted the Rust and Ruin theme,please use this link.